“As we continue to work on addressing this problem and assess how best to serve our users, we are putting the experiment on hold.” a Google spokeswoman says of the company’s fact-check feature. First, the legitimate outlets chosen were virtually all ones with conservative audiences. The Daily Caller, for example, was given such treatment, while sites like Vox, Slate, The Huffington Post, Mother Jones, and several others clearly on the left side of the political spectrum were not. Second, and perhaps most importantly, many of the fact checks were wrong. One of the purported reviewed claims was for an article that straightforwardly reported that yet another member of special counsel Robert Mueller’s investigative team was a donor for former Secretary of State Hillary Clinton and former President Barack Obama. 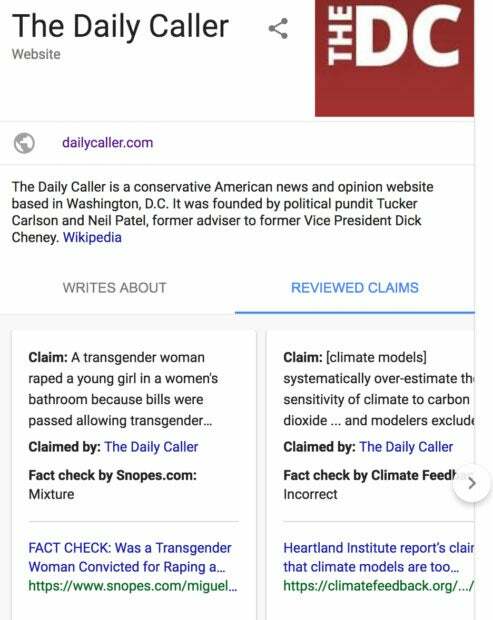 Google attributed the fact check to The Washington Post, something its vice president of communications took issue with. Screenshot from The Daily Caller News Foundation. After days of back-and-forth with representatives at Google, The Daily Caller News Foundation was told it was probably due to the algorithms, something the company doesn’t talk about as a matter of internal policy. 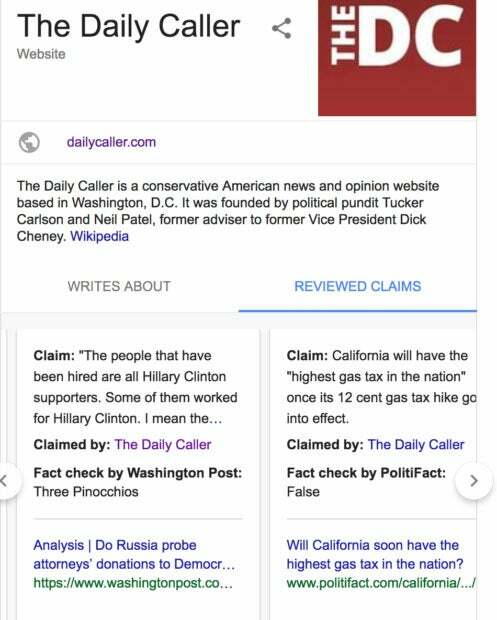 Google removed that single purported fact check at the time of The Daily Caller News Foundation’s initial inquiries, but there were several others that were also false, if not all of them. A quick read of the news piece shows there was no mention of a bill or any form of legislation. The story was merely a straightforward reporting of a disturbing incident originally reported on by a local outlet.